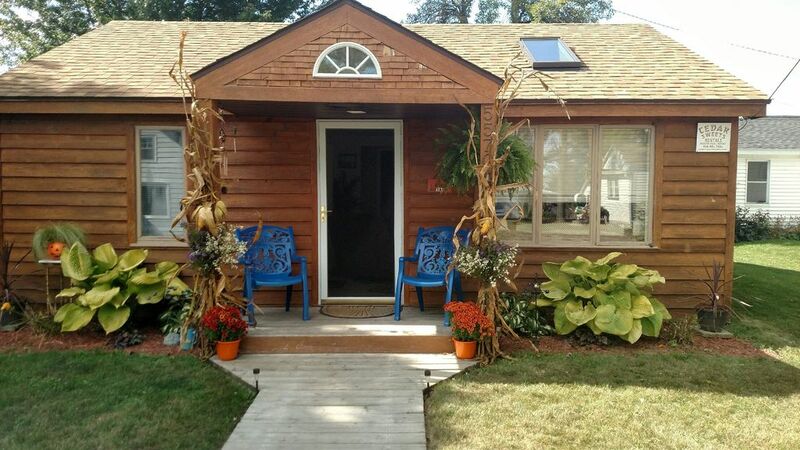 Guests are sure to enjoy a memorable vacation in this fully furnished, 2 bedroom/ 1 bath cottage. The main/master bedroom has a _-queen size bed, while the 1 remaining room is furnished with a queen size bed. comfortable for sleeping 4 people. The relaxing living room is furnished with rocker recliner and a reclining couch. The kitchen is perfect for dining as it is fully equipped . Beautiful private back yard with gas grill and burn pit Situated 1 block from the beach, public boat launch. Walking distance to downtown Lexington, ( 1 block) restraunts, winery, shops, Pub, Village Theater, Salons, and Churches. No Pets Please, And No Smoking Inside. There is a 3 night minimum stay for memorial day and a 4 night minimum stay 4th of July. My wife and I wanted to get way for our anniversary. This location and property was fantastic. I would recommend it to anyone. We were able to walk to down town and to the peir in minutes. A nice little fire pit for a cozy fire. it is a quite area, Just what we were looking for to get away and escape from day to day life for a weekend. A comfortable and cozy place to stay. I enjoyed my stay at Cedar Sweets very much! I have been to Lexington many times, but mostly stayed with friends. This was my first experience with Cedar Sweets, and it did not disappoint! Well appointed, very clean and neat. Everything you could need in the kitchen, plus! The backyard has a very nice deck with plenty of outdoor furniture and was very well landscaped. I will definitely return! Thanks to Terry for being a wonderful host! Cedar Sweets is sweet. This was our sixth year at Thumbfest, a one-day, free music festival and our second time staying at Cedar Sweets. Great location to attend the festival. Great location to do anything in Lexington! Communication with the host is great, which is a must for us when we're traveling, and the cottage is very clean - and we have a high bar. Thanks, Terry! Cedar Sweets is fantastic and then some! My gal friends and I had an amazing 'girls weekend' staying in this sweet cottage. From the minute we walked in,(it smelled so good) until we departed, we knew we had found the right place to stay. Everything was so clean and very well supplied. The beds were very comfortable and the bedding was very nice. We had more than ample towels, extra bedding and many extras. We really enjoyed the backyard patio with comfortable patio table and chairs. It was peaceful, private and quiet. We couldn't have asked for a sweeter place than 'Cedar Sweets' ! The owner, Terry, was very nice and caring. He called just after we arrived, to make sure we got into the cottage alright. Inspite of having dreary weather most of the weekend, we loved the location and had a great time anyway.. We also had a wonderful dinner at the Windjammer Restaurant ! Everything is within close walking distance! We will be back! Thanks again Terry! Greatly impressed at first sight. Cute, clean, and cozy. Great attention to detail, from the folded towels to the bottled water, candy, biscotti and peanuts left for us. The cottage had all the essentials, the location was perfect for waking to the beach, dining and shopping. We will certainly be back. We ended up totally falling in love with Lexington! Our “beach” house (that’s what my 3 yr old called it) was perfectly located. We were able to walk to the beach, to grab ice cream, dinner and of course the candy store. Lexington’s Main Street was maybe two blocks away from our place. Everything including the house and yard was kid friendly. The home was clean, decorated nicely and perfect for our family of three. The owners were very easy to communicate with. We loved our days on the beach, swimming and collecting rocks. Just remember to bring watershoes! But the adults can tough it out. The water was warm and clean. Definitely be returning in the future!